Cross-buy, a term so often used. What exactly is cross-buy, and what benefits do we gain from it? A game that has cross-buy can be played on both PS Vita and PlayStation 4. A game that supports cross-buy will have this stated in the game store description. If it’s not in the game store description, the game won’t have cross-buy support! 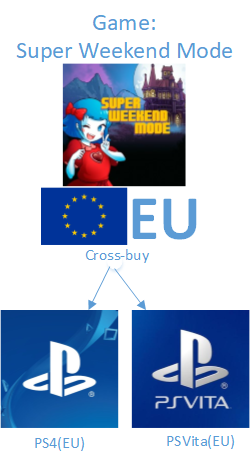 In conclusion: If a game has cross buy, we can play it on our PlayStation 4 and PS Vita. A game can have multiple stacks, meaning it has a separate trophy list for multiple regions. The main 3 regions are Europe(EU), North-America(NA) and Asia(AS). There are a lot more regions out there like Korea(KR) and Japan(JP). Besides geographical stacks, it’s also possible for a game to have different stacks on the Physical and Digital game. Besides the Physical, Digital and geographical(EU, NA, AS) stacks, it’s also possible for a game to have PS4 and PSVita stacks. This means a game has a separate trophy list for both the PS4 and PSVita platform. Information on such lists can be found on sites like PSNProfiles.com, Playstationtrophies.org and PSNTrophyLeaders.com. 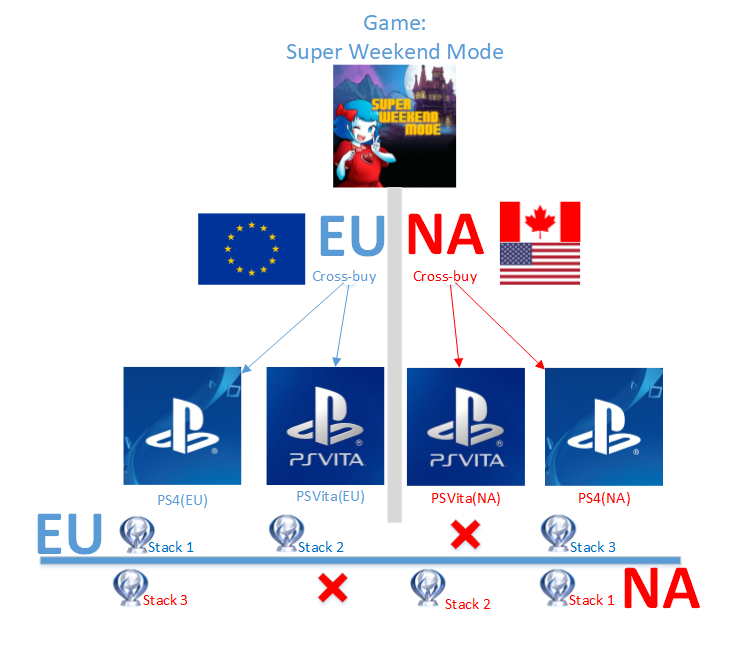 Example: The game Super Weekend Mode has 4 stacks, being those: PS4(EU), PS4(NA), PSVita(EU) and PSVita(NA). It also has cross-buy as we described in the section above “Cross-buy”. This means that if we buy the game on PS4(EU) & PS4(NA) we can earn 3 platinum trophies for this game. If you are from Europe, you can only get the EU stack on the PS vita, since you can’t login with multiple accounts on a PS Vita. There are a few shady ways of doing such, but we highly recommend you don’t try this. This goes the same way for people for the NA and AS regions regarding the Vita stacks. Stacking platinum trophies on different platforms and regions allow trophy hunters to obtain multiple platinum trophies on a single (easy) game. In the picture below we see that Omni_Vocal has multiple platinum stacks on the game Peasant Knight. Multiple stacks(3) on the game Peasant Knight.